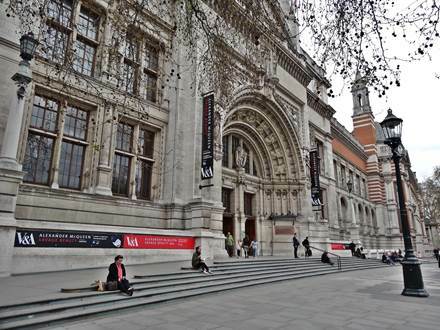 Tip: The premises of the cafe in the Victoria and Albert Museum are sure among the most beautiful in the world. A stylish break in one of the three magnificent designed halls fits perfectly to your trip into this fascinating art world. 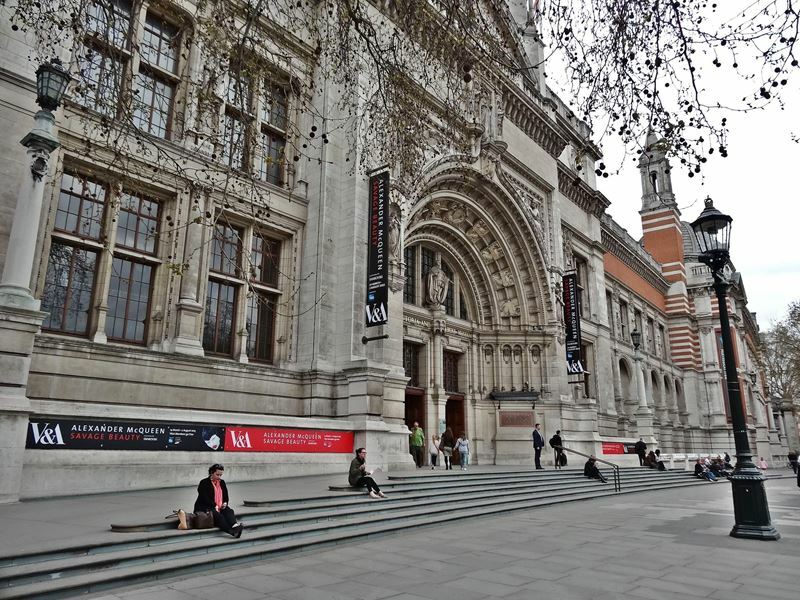 The Victoria and Albert Museum is the art highlight in London. 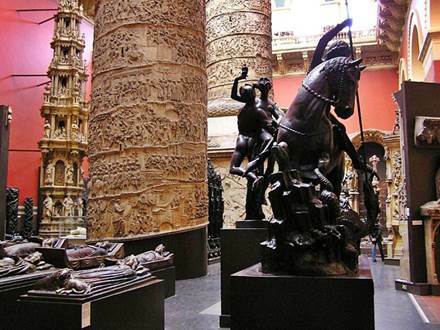 The world's largest museum of art and design offers more than 2.1 million objects from 2000 years of art history to its visitors. The museum is divided into 5 areas: Asia, Europe, Materials & Techniques, Modern and Exhibitions. Some areas are split over different floors. Altogether there are 7 floors in the building (level 0 - 6). At the below mentioned highlights you will find in brackets the according area, the level and the room number. 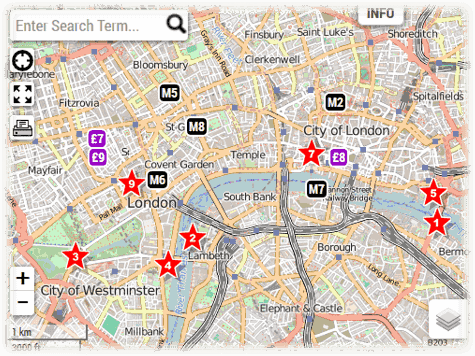 Even if you have only a bit of interest for art you should reserve at least half a day for visit. 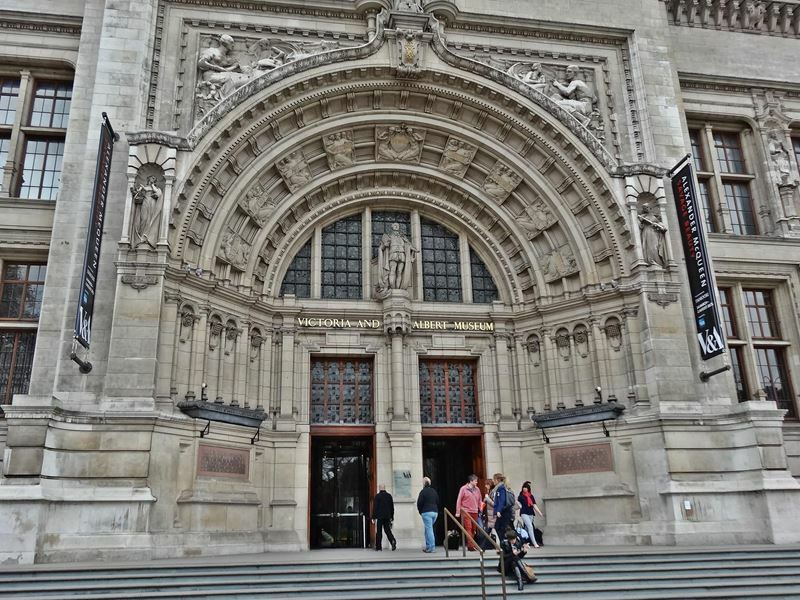 The entrance fee is free of charge as in all national museums in London. It is only asked to give a voluntary donation. This is usually done by some discreet donation boxes at the entrance and exit. 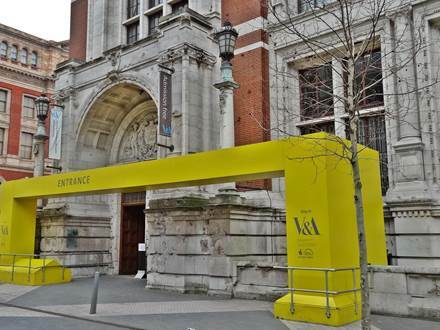 Exhibitions and events are the exception as there may be an admission fee. If you would like to visit the Museum at bad weather conditions you do not have to worry about it. There is a pedestrian tunnel from the underground station South Kensington which leads directly into the museums building. 1. The largest exhibition object is a plaster cast of the Trajan's Column (Europe, level 1, room 46a). The original is located in Rome and has been built in the year 113 A.D. to honor the Roman Emperor Trajan. 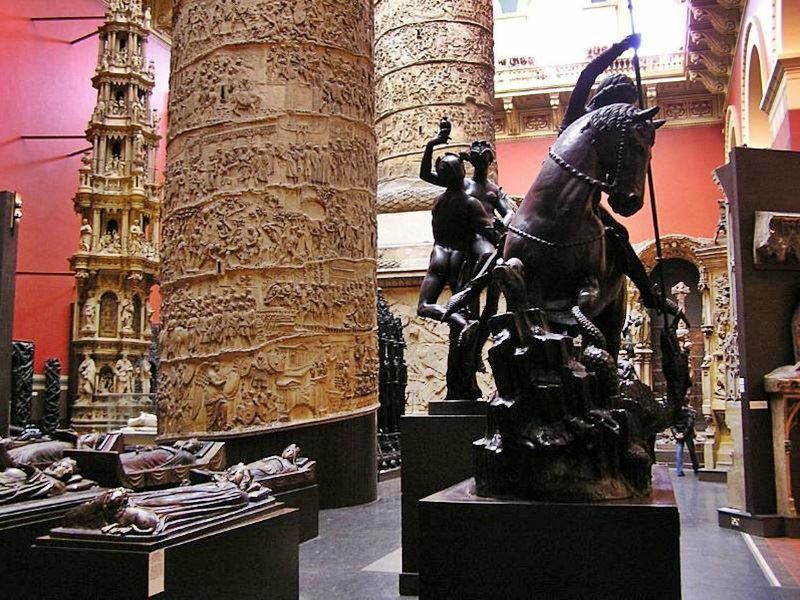 The replica of the column with a total height of around 38 m did not fit into the exhibition rooms, so it was necessary to split it into two parts. 2. 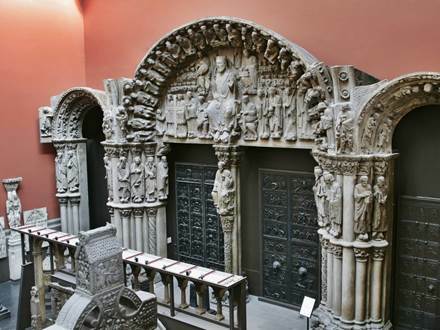 The portal of the cathedral of Santiago de Compostela (Europe, level 1, room 46a) decorated with many sculptures is an brilliant artistic achievement. The original in Spain dates back to the year 1188, the exhibited plaster cast was manufactured in the year 1866 and adorns an entire wall. 3. The Shakyamuni Buddha (Asia, level 1, room 47a) is a gilded bronze statue with approx. 1.4 m height and a weight of about 500 kg. It was produced in the 18th century in China and shows the Buddha just before his enlightenment. The shiny and balanced appearance allows you to participate in this special moment. 4. The wooden sculpture Tippoo's Tiger (Asia, level 1, room 41) shows a nearly life-sized tiger who attacks an European dressed man. The specialty of the sculpture is a mechanism which is driven by a rotary handle and imitates acoustically the screams of the man. This sculpture originates from southern India and was made in the late 18th century. 5. The painting of The Miraculous Draught of Fishes (Europe, level 1, room 48a) by Raphael was painted in the early 16th century. The approx. 4 x 3 m large painting was originally intended for the Sistine Chapel in the Vatican. 6. The Jumpsuit of Mick Jagger (Materials & Techniques, level 3, room 106) is a masterpiece from the recent history. Mick Jagger wore this jumpsuit on the Rolling Stones Tour 1972 in America and Europe. 7. The Museums Cafe (level 1) appears in the first view modern and cool, the entrance area has been lately designed. 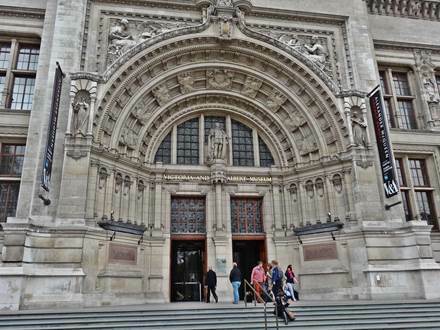 If you turn to the left after the entrance you will reach 3 rooms which were designed in the 1870s. The coffee and cake tastes twice as good if you are surrounded by elaborate columns, magnificent crystal chandeliers and finely decorated ceilings and walls.